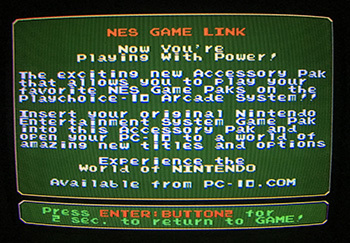 The NES GAME LINK is a revolutionary new accessory for your Playchoice-10 arcade. This cartridge adapter will accept an NES game cartridge to allow for play on your arcade system. Unlike any other adapter previously on the market, this new accessory works with the stock BIOS originally supplied with both Single and Dual PC-10 systems! This means that for the first time ever, you can now use a NES adapter and still maintain the original look and feel to your Playchoice Menu, including the Instruction screens! No need to use the modified BIOS options! (However, it will also function with the modified BIOS options as well, but the instruction screen would not be visible). This amazing adapter allows you to keep your instruction screens accessible whether you are playing your favorite original games or your custom conversions from PC-10.com! A definite must for all Playchoice fans, especially those of you who have a Dual Monitor machine! Don't miss out on those helpful and colorful instruction screens when playing your other PC-10 games like Metroid, Super Mario Bros., etc. Also available for a nominal charge, is the option to have a custom Title programmed for your adapter. By default, the Title will read NES GAME LINK, but we can custom program this line with up to 19 characters (including spaces and all uppercase). 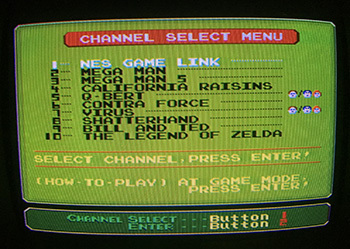 For example, you can have your NES GAME LINK read: POWERPAK, ALL NES GAMES, MARIO'S CHOICE, BOB'S ARCADE, etc. Possibilities are endless! Order yours today! A limited number of Game Links are available for purchase. Don't delay! 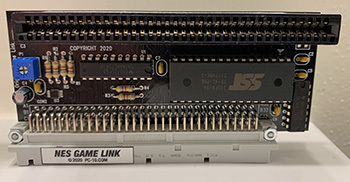 If you need either of the replacement stock BIOS EPROMs, we have you covered as well -- just simply add them to your order below. International orders are welcome! Use the shopping cart below to see estimated shipping costs to your location.